2015 – Time for a CSCS Gold Card? Is 2015 the time for a CSCS Gold Card? In case any reader of this is under the illusion that getting a CSCS card is not important then they are sadly misguided. I was driving down a road close to my home recently and noticed a residential house that was being redeveloped. 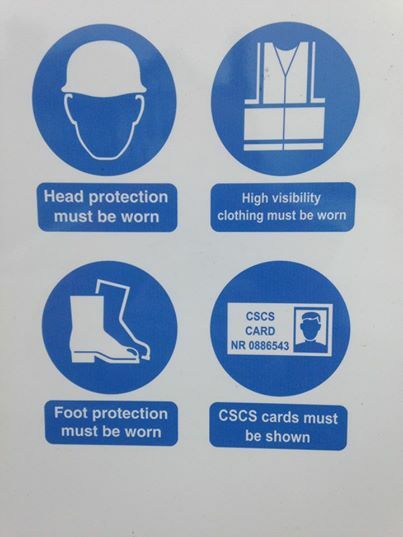 What amazed me was seeing the usual health and safety signs but this one also had a requirement that all personnel had to show a CSCS card. This is not new on large construction sites but the need to hold a CSCS card has now filtered to developing a four bedroom residential property! The picture in this blog is a photograph that I took of the sign. We have been writing for the last couple of years that copper and fibre engineers need to hold a CSCS Gold Card and the message is getting through. We are finding that more and more engineers are realizing that holding a gold card means that they can venture onto any site at any time and as a communications installer team leader can demonstrate that they are experts in their field of work. Employers are also now finding that having their workforce fully qualified and accredited provides benefits too. Not only can they send any engineer to any site, but they also make their businesses more attractive when it comes to tendering for work. Some companies will now no longer allow engineers on site unless they are in possession of the right levels of CSCS card. 2015 will see a growing demand for structured network engineers to hold the right level of CSCS Card. To get the Communications Installer Team Leader CSCS Card engineers will need to be accredited with a Level 3 qualification. We offer an online course that allows engineers to build a portfolio of evidence and become accredited. There is no need for them to take time out of work. They simply need access to the internet and be prepared to upload the necessary evidence and answer questions relevant to their industry. Once they have their level 3 qualification (can be completed in a matter of weeks), they then need to sit the CSCS Health and Safety test before getting their Gold Card. There are a number of engineers that managed to get a CSCS Gold Card using grandfather rights, but this route has now closed and they will need a level 3 qualification to renew their card. We offer two routes for the qualification – Fibre and Copper. Fibre is for engineers that can collect evidence of both fibre and copper installation and the copper route is for those engineers that only work with copper and have no experience of copper installations.